S-B25S Automatic Can Body Separator horizontal design. Sored can cylinder is carried by a timing screw and a turret. Inner cutter shaft enter can inside and carry cans forward to meet an arc outer rail blade. Cutter edge squeeze the scoring line to separate the can cylinder. Separated can cylinders exit by two individual outlet chutes. With centralized greasing system and multiple safety devices, easy for maintenance and can size changeover. 1. Model type 3H 6H. 2. Range of cans dia. 200 - 401D. 3. Range of double can height 76 - 184mm. 4. Capacity per min. (before separating) up to 250 cans up to 500 cans. 5. Capacity per min. (after separating) up to 500 cans up to 1000 cans. 6. Horse power required 3hp. 7. Floor space overall height 2040 x 1150 x 1500 mm. 8. Net weight 2600 kg 2900 kg. 1. Suitable for 3 pcs can bodies, either soldered or welded. 2. Recommended for double reduced tinplate can bodies. 3. Simple design and easy to maintain. 4. Easy to operate and adjust for different can height. 5. Easy and quick to change can size. 6. 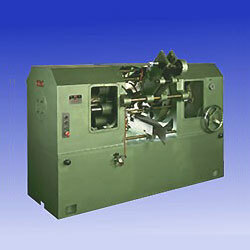 Equipped with hight speed steel cutter. Carbide cutter is available on request.